Ice Breaker is a pretty interesting and polished puzzle game created for the Game Maker winter games contest; it's one of the best entries for that contest that I've played so far. 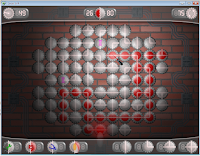 It has to do with maintaining a colored line of power by rotating nodes, eventually coloring the entire puzzle red. There are a number of levels and special items and other variations to keep it interesting. In feeling and atmosphere (but not in gameplay) it's similar to the Ac!dbomb series, so it's recommended for fans of those games. One of the nicest parts of the game is that any level can be played in one of three modes (without a time limit or a move limit, with a time limit but no move limit, and with a time limit and a move limit) and the point value the completed level gives you depends on which difficulty mode you completed it in; more points open up more levels.